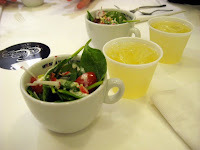 The salads and sandwiches that Parisi Café offers change on a daily basis, pending what local ingredients are available to the chef. Today’s menu started with the Bacon & Blue Salad, which had fresh baby spinach, red onions, radishes and bacon with a buttermilk blue cheese dressing. I loved the use of radishes here -- I’ve always been a radish fan, and I think they’re generally underused in the salad game. 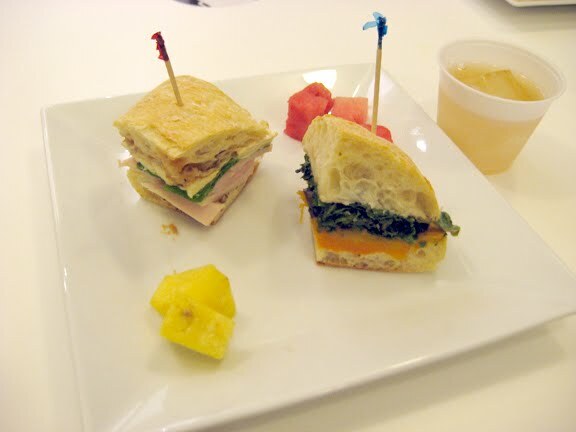 Next we got to sample two sandwiches. The first was the Roasted Squash Sandwich with butternut squash, Tuscan kale, mushrooms, pomegranate vinaigrette and a mild gorgonzola on tasty, chewy French bread. It was a delicious combination of flavors. The gelato was very rich, especially with the caramel sauce. Even though it’s not listed on the menu, we’re told you can still order it. 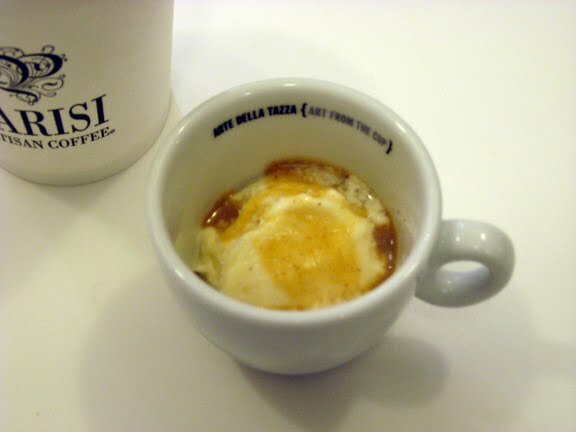 Or you can get an Affogato ($3.25), which is the gelato drowned in espresso. I should have grabbed one of these before heading back to the office -- WANT. Robert and I sat at a table with Scott Connerly of KC Perky and talked with him while getting to try all this goodness. If you’re looking for more info on Parisi Cafe’s coffee and coffee-related expertise, Scott has a great write-up on his site that’s definitely worth checking out, as well as a second opinion on all the eats. 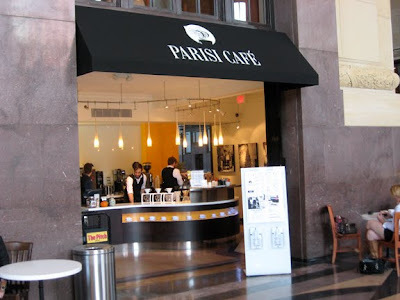 All in all, I’m looking forward to stopping back in at Parisi Café for lunch. I’ll be the obnoxious guy calling at 7:02 every morning to see if they’re going to have the Turkey & Brie that day. A big thank you to Parisi Café for the invitation.